Arsenal manager Arsene Wenger has added his voice to the call to award points for goals to encourage attacking play. Wenger has a solution for the Premier League, who will discuss falling attendances at a shareholders' meeting. He told the News of the World: "You have to try and encourage teams to keep on attacking when they are in the lead. "What could work is awarding points on the difference between goals scored and conceded - an extra point if there is a difference of three, like 3-0 or 5-2." The Gunners boss conceded that it would be difficult to introduce and implement new legislation. 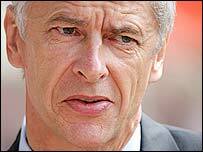 Wenger added: "It is difficult to impose new rules but the intention should always be to win. "The most successful teams have always been attacking ones. "Brazil have won more World Cups than anyone and Real Madrid more European trophies - and both of them always play to win." Wenger's suggestion is unlikely to find much favour and Premier League chief executive Richard Scudamore admitted told BBC Radio Five Live: "I don't like it. "It's one for debate but I think it's too contrived."